Fully riveted maille didnt really exist until at least 1300 in case you're wondering. I wouldnt go after flat ring round riveted either because that stuff is junk, I had some and the inside of the maille is scratchy, round ring riveted is much smoother and wedge riveted is basically flat inside. But I am telling you the half solid stuff is what they used. But I am telling you the half solid stuff is what they used. Yep, for crusader period the standard answer is alternating riveted and punched rings. Fully riveted became popular some time in the 14th century from what we know. Wasn't round wire dome riveted with solid punched flat rings used during the 11th century? I've been trying to find out what type of maille was used when. 11th century you're looking at round riveted round ring with alternating flat punched rings as well. Anywhere between Roman and to the early 1200s almost all maille was made that way. Some was smaller rings some was bigger but they all are pretty much the combo of round ring round riveted with flat punched rings. Thats part of the reason I sold my entire fully riveted maille set off and exchanged it for half solid though I went with wedge riveted cause I couldnt find round ring riveted. Though my coif is fully riveted it's a rare Erik Schmid coif so I am keeping and using it anyway. I would suggest all the best stuff's maille because it's both cheap and more accurate to the early medieval. For the later period I would suggest GDFB Wedge or Icefalcon wedge riveted. Though for a German impression you can get away with wedge as long as your kits above either the 1220s or 1230s. Mwahhaahaha! I looked every were on the internet. Real archeological finds of full round rivet mail armor existing in even the 12th century. Note:it is Norman mail, on first link. Second like is website listing pics of different findings of mail in a lot of century's. 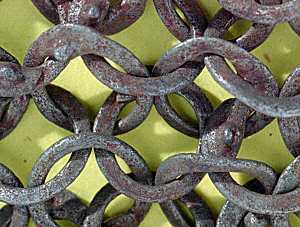 3rd link is full round Ivey 13th century Viking mail. This last link is more 12th circa mail. Good links. I can't see enough detail on the wikipedia picture, but good info on the other links. One of those maille examples on that viking site resembles mine quite a bit. The flat ring wedge riveted one I mean. Now that there is proof of full round rivet mail in those centurys. I will go buy it. When you say 'full round rivet' am I right in thinking you mean round links (as opposed to flat)? As Sir William said, there is round ring and flat ring. Round rivet and wedge rivet. You can have round ring round rivet, flat ring round rivet, flat ring wedge rivet... I haven't seen any repro round ring wedge rivet but there is some that looks to be that style historically. Some historical maille is also "flat round ring" where the ring is neither round nor flat, but rounded on the sides and flat on the top and bottom. It gets complicated. I've seen examples of that last one, Sir James...and those flattened rounds looked stamped with letters of some sort; think I saw both a Muslim and a Russian example of such work, on the AA. Now, I've another question- footwear. How accurate to the 13th would this be? I hope they are, because I really hate short boots. Post pics once you've gotten your maille! Any further updates on your project?